Referred to as an aristocrat, the Afghan Hound’s appearance is one of dignity and aloofness. 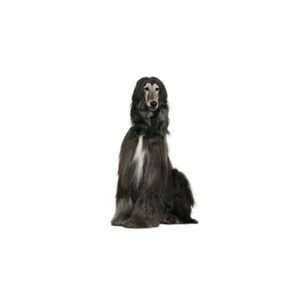 Well covered with thick, silky hair, very fine in texture, the Afghan hound’s coat is a sort found among animals native to high altitudes. They can come in all colors, and while the breed is an excellent hound (hunting by sight) its popularity here has been generated by the breeds spectacular qualities as a show dog. The Afghan hound was discovered by the Western World in Afghanistan and surrounding regions during the 19th century. As the breed developed in Afghanistan, two distinct types evolved from the southern and western desert regions and the northern regions. During WWI, the breed literally disappeared in the Western world. The start of the Afghan Hounds we have today dates back to 1920 when a group of them was brought to Scotland.